The Financial Accounting Standards Committee of the American Accounting Association (the Committee) is charged with responding to requests for comments from standard-setters on issues related to financial reporting. 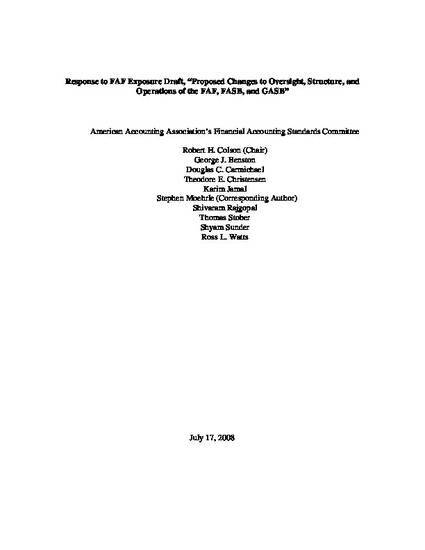 The Financial Accounting Foundation (FAF) released for public comment on December 18, 2007 with a response period ending on February 10, 2008, “Proposed Changes to Oversight, Structure, and Operations of the FAF, FASB, and GASB” (the proposal). This commentary concerns four important public policy issues in the proposal with the most relevance for accounting standard setting: 1. Reduce the size of the FASB from seven members to five; 2. Retain the FASB simple majority voting requirement; 3. Realign the FASB composition; and 4. Provide the FASB Chair with decision-making authority to set the FASB technical agenda. On February 26, 2008, the FAF accepted all four proposals that we commented on. Despite their approval by the FAF, we maintain that each of these proposals not only does not improve, but potentially weakens the standard setting model. We encourage the FAF to renew its commitment to a member selection model designed to create an independent standard setting board. The four proposals put forth by the FAF can only increase the political nature of the FASB, further concentrate decision making power, and create higher barriers to achieve general acceptance of accounting standards. We maintain that the FAF should move in the opposite direction. In particular, we recommend that the FAF not reduce the FASB size and adopt a supermajority requirement not a simple voting requirement. If the majority cannot convince other members of the FASB about their views, how can we expect general acceptance of accounting standards in society? We also want a FASB that is open to more diverse views and more democratic. We urge the FAF to renew its commitment to openness and engagement with the accounting community instead of becoming more elitist and further concentrating power in the hands of a powerful chairman and a smaller standard setting board.